Despite working in the commercial flooring industry for 15 years, I really hate carpet. I think it's gross. There, I said it. 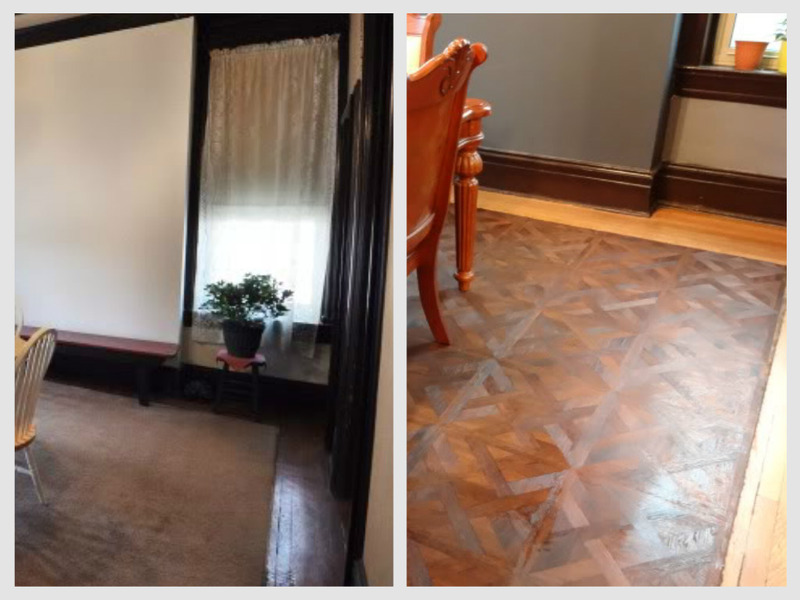 Our 130 year old house has an absolutely gorgeous dining room with original gasolier, tons of natural light, box beam ceilings, and of course, an area rug inlay. When we remodeled the room and took out the ancient and dirty area rug, I said to myself, "No way am I getting a custom rug made for this huge space and then having to take it to be cleaned 3x a year because every animal in the house makes it their barf bucket." So we put down a no-glue vinyl that looks like parquet. Pretty snazzy, eh? With a baby on the way, no soft surfaces in sight, and sticker shock from the price of activity mats ($70!? 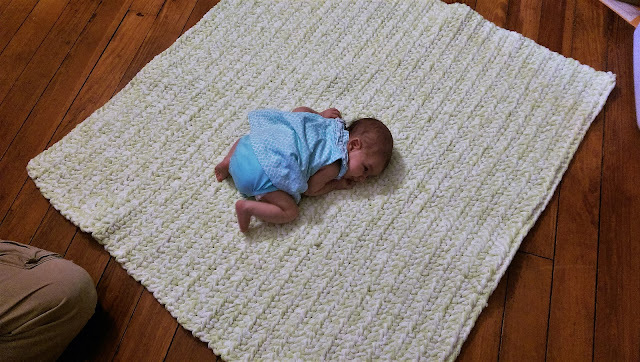 ), I decided to make a blanket/rug/mat that can do tummy time duty and also go in the washing machine. Of course, I picked this Bernat Baby Blanket yarn and was thinking I could get by with 4 skeins. $40, maybe less with some coupons, yay, I saved money! I'm so smart and skilled and frugal! Welllll of course, I didn't really like the weight of it with just one strand and the recommended hook size, so I decided to double up on two colors (Lemon Lime and Sweet Cream), which meant 3 skeins in each color for a mat that ended up The end result is hefty like a rug while still being machine washable, and is a pretty easy weekend project, but let's be honest, with some coupons or even thrifting, I definitely could have found SOMETHING for less than $60. I did spend less than that on the yarn thanks to coupons, but I do firmly believe that crafters need to pay themselves for their time, as well, which makes the cost of this project at least double that of buying an activity mat. Is there a word for when you spend too much when you intended to save money? I tried to find something in German for that. I failed. But I bet it's there. And yes, in the old house we only had about 8 sq foot of carpet. And every cat wanted to barf there.